Psalm 109 (110), Dixit Dominus, has been set numerous times during the renaissance and baroque periods. This can be explained by the fact that it is the first psalm in the Vespers liturgy, one of the main services in the Roman Catholic Church. In the baroque era composers might have felt attracted by it because it includes some very dramatic passages. That goes in particular for verses 5 and 6: "The Lord at your right hand will crush kings on the day of his wrath" and "He will judge among the nations, he will heap up the dead: he will crush the rulers of the whole earth". Composers were ready to explore these strong images and translate them into their music. One of these composers was George Frideric Handel who in 1706 travelled to Italy and arrived in Rome in 1707. There he composed his only setting of this text. It became one of his most frequently-performed pieces from the Italian period. A work laid out for five solo voices, four-part choir, strings and basso continuo one notices how he uses his dramatic talent to the full, not in an opera this time but in a sacred work. It has to be said that at that time there often wasn't that much of a difference between the sacred and the secular. Oratorios from the early decades of the 18th century are often barely distinguishable from operas. That said, the ecclesiastical authorities didn't approve of sacred music written in the operatic style. This explains why a composer like Alessandro Scarlatti, no mean talent in the dramatic department, composed a considerable number of sacred works in the stile antico, linking with the tradition of the 16th century, and in particular the work of Palestrina. Two settings of this same text from his pen are written that way. He also composed two pieces with orchestral accompaniment. This is the first time one of those settings has been performed side by side with Handel's Dixit Dominus. There is some speculation about the influence between these two. Owen Rees entitles his liner-notes "Handel and Scarlatti: A Roman Encounter". That is a bit too bold for me: we only know about a meeting between the two composers from John Mainwaring's biography of Handel from 1760. Otherwise there seems to be no firm evidence that they met at all. However, as Rees writes, it does seems very likely. After all, both composers were in Rome at about the same time and were supported by the same people from the highest echelon's of Roman society, in particular some cardinals. Rees compares the two settings at length which is very helpful to the listener. It is striking how many textural similarities these two works show. In many verses the scoring is similar: the use of solo voices or tutti, and the creation of contrasts. In most cases Rees rightly states that Handel's work is the more dramatic. That goes especially for the tutti episodes: the choir is used to great dramatic effect. Handel also takes some steps further in the exploration of the dramatic capabilities of the orchestra. Scarlatti's setting certainly isn't devoid of drama; it is especially in the solo episodes that he shows his credentials. One of the best parts is 'Dominus a dextris tuis' which he sets as an aria for bass and which has strong operatic traits. Notable is the role of the obbligato violin. Considering the way Owen Rees underlines the dramatic nature of both settings, albeit in a somewhat different way, it is disappointing that so little comes off in the performance. The Choir of The Queen's College Oxford is certainly a good ensemble, but the choral parts have insufficient bite. Much more can be made of the choruses in Handel's setting, especially through stronger dynamic accents. That would have given more impact to, for instance, verse 6, 'Judicabit in nationibus'. I also find the balance between the choir and the string ensemble unsatifying. The choir comprises 33 singers whereas there are just six violins and two violas. The most incisive and dramatic version I know is the one by the Balthasar-Neumann-Choir and -Ensemble under Thomas Hengelbrock (Deutsche Harmonia Mundi, 2004) whose orchestra is about twice as large. It is also down to the playing of the strings that the instrumental parts have too little impact and fail to underscore the work’s inherent dramatic power. The playing is too flat, too nice and lacks sharp edges. The tempi in this recording are generally slower than Hengelbrock's, which I find more convincing. I can't remember having heard Scarlatti's Dixit Dominus before. It is a nice work which I am happy to have the chance to become acquainted with. It confirms the qualities which Scarlatti displays in other pieces I have heard. However, I feel that it could have been performed with stronger contrasts and more passion. That way it would have made a more lasting impression. The bass aria I referred to above is one of the highlights, also because of the fine performance by Matthew Brook. Generally I am not that impressed by the performances of the soloists. They are mostly alright, but no more that that. One of the nicest parts is the duet 'De torrente' from Handel's setting, which is exquisitely sung by Elin Manahan Thomas and Esther Brazil. 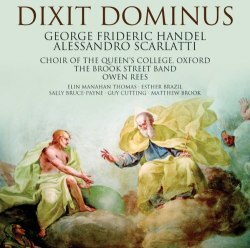 On balance it is Scarlatti's little-known Dixit Dominus which is the best selling point of this disc. The possibility of a direct comparison between the two settings is also a desirable feature. However, the performance of Handel’s masterpiece compares unfavourably with the competition.